AMCS Technologies, specialised in safety products for lifting machines, and the company Acreos which designs and manufacturers simulators for machine training decided to combine their technical expertise in a partnership. 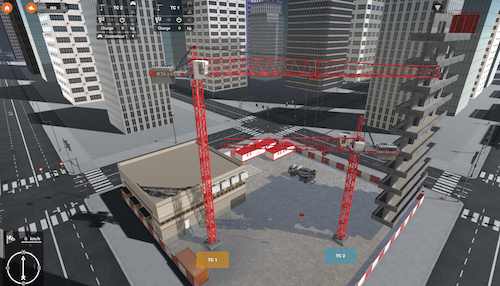 Thus, Acreos is in charge of the development of a crane simulator for AMCS, the SIM 61. This device will create a fully configurable virtual 3D site. 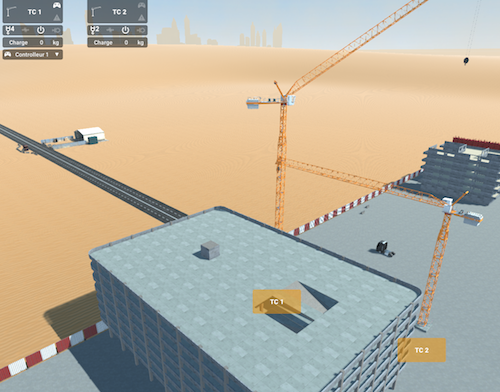 Once the environment is created, it is installed on a computer connected via wired connection to the AMCS anti-collision devices DCS 60 or DCS 61-S and will simulate the different sensors fixed on a real crane. The data collected by these sensors are simulated by the SIM 61 which sends the information like a real crane to the system. From the R&D offices of AMCS technologies, the systems react in the same way as on a real job site and the simulation of anti-collision between cranes in interference can be tested. Acreos uses the know-how of AMCS technologies to improve the training of apprentice crane operators in real conditions. The simulator will use the DCS 61-S systems installed on the cranes to collect data in real time thank to its data logger function, the position data of the machine during the exercises. The trainer can then analyze them and debrief with the student on his performances.